Earlier this year I did a map project for South Puget Sound Community College. The maps I made have been available on their website since spring, but the new wayfinding kiosks and monuments were just installed in the last few weeks. It’s always fun to see my work out in the wild! Maps are fascinating. A huge amount of tiny decisions go into each one: what really needs to be shown? Is it more important to be accurate, or representational? Do you look top-down, or illustrate all the building faces? Is up north, or the direction the reader is facing? In this case there’s a lot of detail because the map needed to include all campus services, routes, and parking options. The buildings are all sized accurately, but the two sections of the campus are squeezed together to keep the map printable on a normal sheet of paper. While everyone would have loved cutely illustrated building elevations, that was out of project budget, so I just drew roof-lines (and picked a sun direction for cast shadows). The issue of ‘north up’ or ‘heads-up’ was one we discussed and researched a great deal before bowing to budget and time constraints and the oddities of the campus. Studies in New York have shown that ‘Heads-up’ maps — maps which are oriented to align with the direction the reader is facing — are easier to use for most people. Heads-up mapping requires a new map orientation for each kiosk alignment. 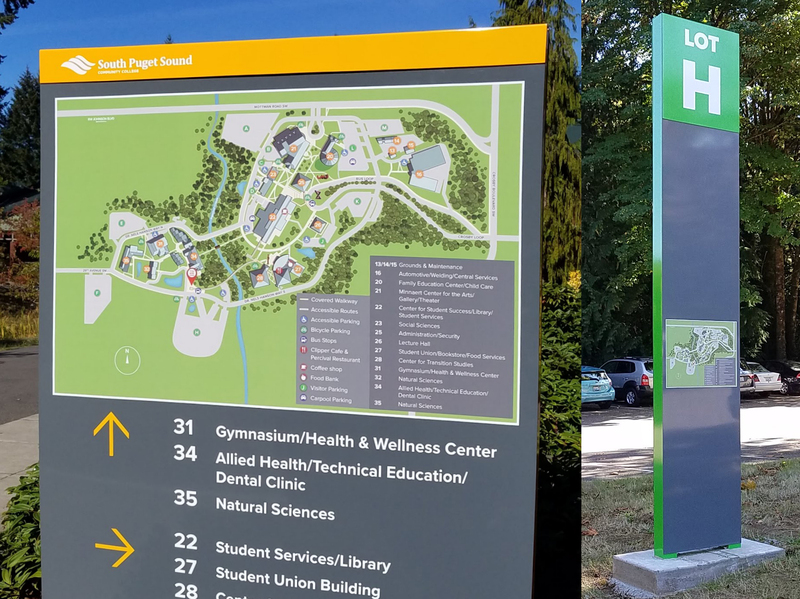 Because the SPSCC campus isn’t laid out on clear east-west north-south lines, a heads-up approach would have required at least eight different angles — some of them quite odd, as the kiosk angles were chosen for maximum visibility from SPSCC’s walkways, which are oriented 30 degrees off of north-south in the east campus and 25 degrees off in the west campus. Eight or more different designs of an already complicated map were too much to handle, so we stuck with “North up”, which at least has the benefit of being standard and expected. As one of the roughly 15% of people who prefers north-up, that works fine for me — but I now have such a good mental image of the SPSCC campus I’ll never need to look at the map again! I can understand the need to be consistent within budget restraints, so going for the "North Up" structure; however an indicator as to what way one is looking when staring at the map would help lean towards the "heads up" orientation. which would help those who can't esily s[in the map in their heads. I'm quite happy with the north up method, having spent several years as a boy scout reading paper maps. Google isn't helping people learn to handle north up, is it? There's definitely some concern that in-car navigation and phone-navigation is making it less common to be able to read a north-up map! I'm not sure if there's any data to support it. Phones are so prevalent it'd be hard to find a control group. In my entirely non-scientific polling, I found that people who hiked a lot or had a good sense of direction and people who were already good at 3D visualization preferred north-up, which isn't surprising. It's actually another argument in favor of heads-up maps, because the minority who prefers north-up is also better at finding their way in general, so we don't need to be catered to. Unfortunately the extra work and production cost of so many different orientations is often prohibitive, and it's tougher to design. In this case we wanted to show the whole campus on every map, and the campus isn't square, so we would've had to squish things or have different kiosk shapes, which would present even more problems! In NYC the heads-up maps don't even attempt to capture the whole area, just a square around that particular kiosk. It's still a crazy amount of different maps to make, but a much easier design to work with. I definitely think that having the 'you are here' arrow indicate the direction the reader is facing is helpful. I didn't do that part of this project, but I suspect it wasn't used because it would double the amount of maps to keep track of (each kiosk has two sides, so you're facing opposite directions). It's also a very busy map, and the tear-drop 'you are here' marker is clearer than an arrow from a distance. Somewhere I have a picture from a trip to Japan years ago of a map that was nicely marked in English with "You are her." Not true for everyone, but it was accurate for me!